Also, this would explain Romney’s campaign promise to poison the Gotham City Reservoir. Mind you, I do not actually write minuets. 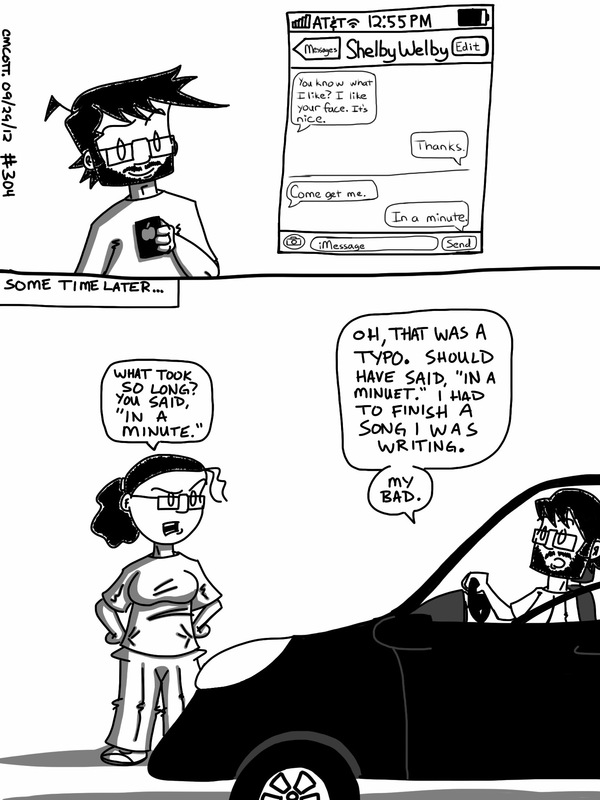 I’m not the best with time management, either. I don’t think I will ever write something better than that second panel. Seriously, I should just give up now and close shop, ’cause that’s the apex. It’s all downhill from here. 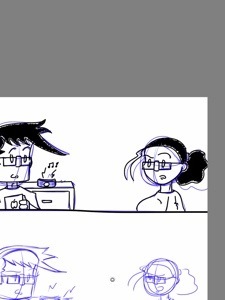 Just a quick preview of what’s to come later today. 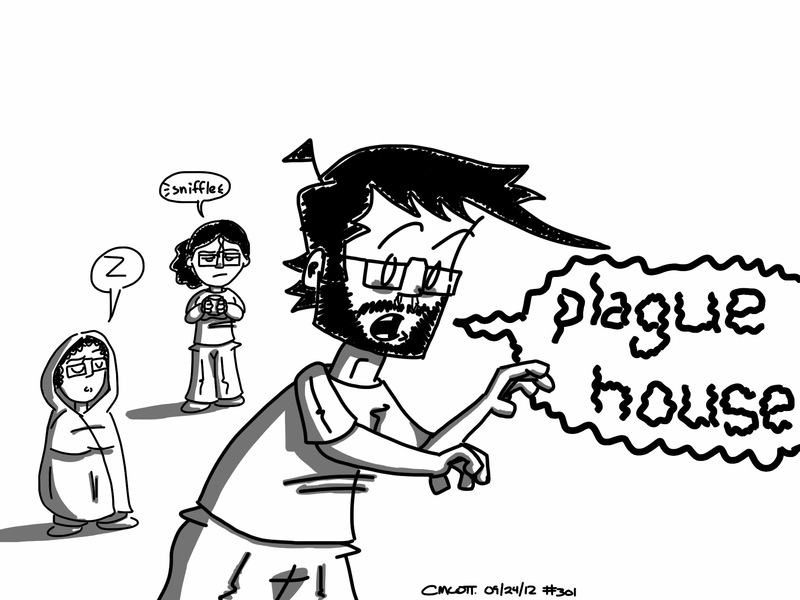 Sorry the comic updates have been so hit-and-miss lately; I’ve been fending off the plague. 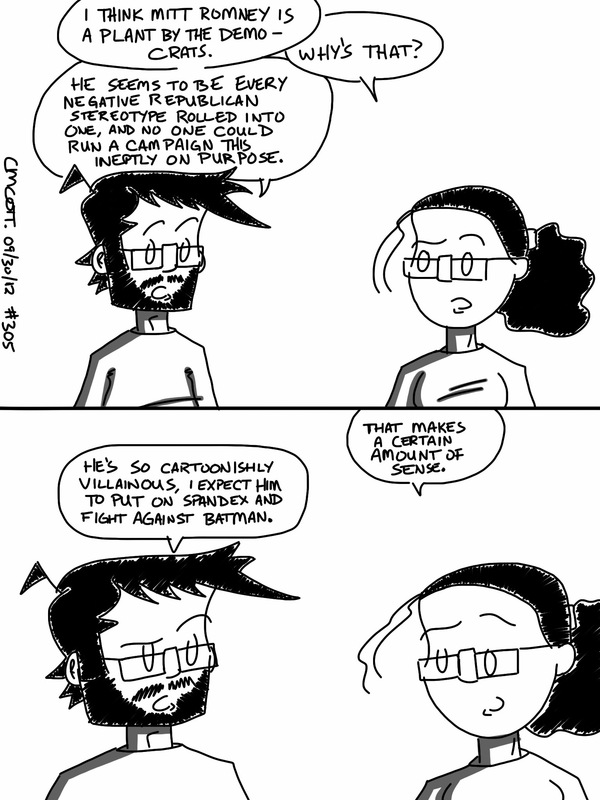 Here’s another oldie but goodie from the days of the Blogspot blog. Enjoy! Poor Ringo was always the least of The Beatles. He wasn’t the writing genius like Lennon or McCartney, he wasn’t a spiritual guru like Harrison. He was this affable little man with a big nose who had an extremely limited vocal range and who occasionally sang songs about underwater gardens and brightly-colored submarines. It’s difficult to take Ringo seriously, honestly. This isn’t to say that Ringo is without his charms. He is affable, after all, and he has a certain charm to him that’s hard to deny. Ringo is just so damn likeable. He’s loveable, and you honestly want to see him do well. You root for Ringo. And so when The Beatles broke up in 1970 and inevitably started releasing solo records, you knew it was only a matter of time before even Ringo jumped into it; because honestly, he’s a Beatle, and Beatle = instant chance. So he put out a couple of almost noveltyish records, and then released Ringo in 1972. The thing about Ringo? It’s really pretty damn good. 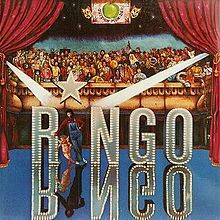 Ringo knows what folks want to hear from him–vaguely folky, bright, uptempo songs that are poppy, fun, and probably just a little superficial; it’s what we expect of Ringo–and he delivers here. There’s not really any filler on the record, which is to say that all the songs are pretty decent. There are standouts, of course: “Photograph,” a song he co-wrote with George Harrison, is a fantastic number, as is his cover of “You’re Sixteen.” “Oh, My My” is fun, and “I’m the Greatest” (written by Lennon) is a tongue-firmly-in-cheek celebration of status, even if it’s only presumed status in one’s own imagination. The record maintains a consistent feel, which is that of a good time with old friends. There’s nothing groundbreaking here, nothing as overwhelming as All Things Must Pass or as daring as Plastic Ono Band or as self-consciously homemade as McCartney. This is just a fun record, and it succeeds on that level very, very well. The CD release of the album actually manages to sweeten the deal, adding three bonus tracks–including the single “It Don’t Come Easy”–to the already strong record. Really, if you have any love at all for old Ringo, this is a fantastic record (much better than…well, pretty much anything else he’s released). It’s a comfortable, fun, almost superficial (in the best possible sense of the word) album that it’s hard not to enjoy. You’ll tap your toes, you’ll sing along, you’ll be glad you’re listening to it. Not liking it would be like not liking a puppy, and do you really want to be known as the person who doesn’t like puppies? 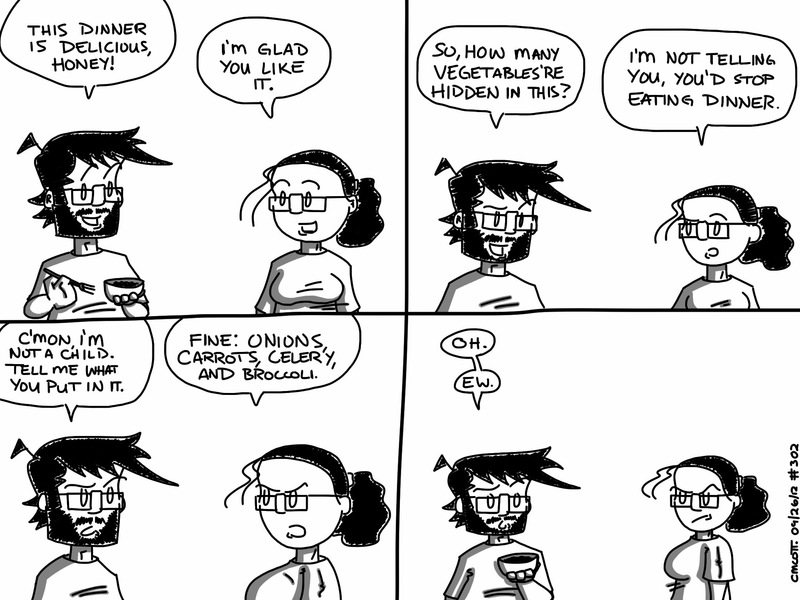 I kid, but she tries to hide veggies in all sorts of things. Like meatballs. Meatballs! When I first heard “Flaggin a Ride” this summer, I was sitting in the car with my brother. He turned to me and asked, “Isn’t this that new band Britt Daniel’s in? It sounds just like Spoon. Why not just make another Spoon album?” And I’ll admit, I was hard-pressed to come up with a response. 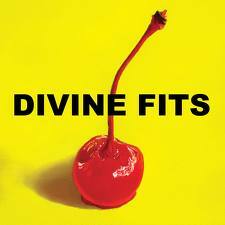 On the surface, A Thing Called Divine Fits could have easily been a new Spoon album, with its stripped-down instrumentation and choppy vocals. Sure, there are some snyths here and there, but that’s not too far from where the band’s been headed the past couple of albums anyway. All that being said, it is a slightly different animal than your usual Spoon record. For one, Britt Daniel isn’t singing every song. The other two guys in this project (both of whom I’ve never heard of, and I can’t say I’m all that familiar with the bands they’re in, either) both bring their own thing to the table, really, and it ends up a bit of a mash-up between the sound of the three members’ own work. Thankfully, it’s a solid album full of catchy, well-crafted songs. The aforementioned “Flaggin a Ride” wouldn’t have felt out of place on Transference, the last Spoon record. Really, all of Britt Daniel’s contributions here (including a cover of “Shivers”) are pretty solid, and the rest of the band throw in a few great tunes, too. “Would That Not Be Nice” is a standout track, while “Civilian Stripes” is an acoustic-driven ditty that breaks the tightly-wound tension of the first half of the album. That first half is pretty relentless, with driving rhythms, sharp and clipped vocals, and dueling guitars and snyths. It some of the best stuff I’ve heard all year, actually. Ultimately, A Thing Called Divine Fits is a pretty solid debut from a group of guys who have spent years honing their respective crafts. It’s a nice summation of what these three musicians can do, and hopefully the first of many more albums to come from the group. Everyone in the house appears to have caught the same death plague at he same time. We are all dying and should likely be quarantined. Here’s another old album review from the dark, dark ages of 2004. Before the Flood is a collection of cuts from a 1974 tour that Bob Dylan and the Band–both coming off mediocre albums–put on to recapture their audience’s attention. And damn did it ever work. The Dylan cuts here seem as if they were performed by a man and a band possessed. He tears through familiar tunes in new arrangements and new settings, completely altering familiar songs until they were barely recognizable. And the songs that were recognizable were still so different and alien, the audience barely knew how to react. That being said, the reinterpretations are phenomenal. Dylan has always made an effort to defy his audience’s expectations, and by the mid-’70s, they’d finally come to appreciate this fact and to embrace it. 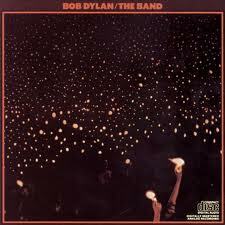 The roar of the crowd on the double album makes it clear that Dylan’s fans still love him and his music, however he may twist it and change it. The Band’s tunes, which mostly appear in the middle of the set, are a brief respite from the storm. There are no surprises here–The Band play things pretty straight, giving close reads of some of their best-known tunes, including “Up on Cripple Creek,” “The Night They Drove Ol’ Dixie Down,” and “Stage Fright” on disc one, and “The Weight” on disc two. This straight-forward work by The Band on their original tunes actually works to the album’s advantage, though, as it provides a baseline against which to compare and interpret Dylan’s radical reworkings. 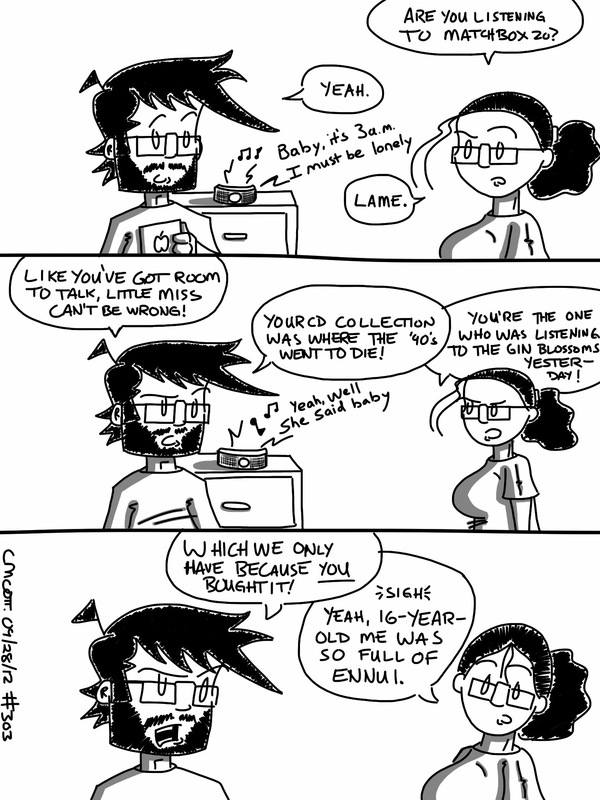 Dylan’s song selection stuck mostly to older, more established tunes from his first six or seven albums. Tunes such as “Like a Rolling Stone,” “Lay Lady Lay,” “Blowing in the Wind” (the album’s closer, in a very different version from the original solo acoustic), and numerous others seemed obvious and well-loved choices, but some of the tunes Dylan played were outside of expectations. Including “Ballad of a Thin Man” and “Highway 61 Revisited” from Highway 61 Revisited, and “It’s Alright, Ma (I’m Only Bleeding)” (played by Dylan solo acoustic at a breakneck speed) kept things even more varied and unpredictable. Before the Flood captures Dylan and The Band at a performance ability peak, and presents them as a force of nature that tore through songs, the audience, and expectations. The results are phenomenal and worth listening to, and the album rivals any of the recent excellent Bootleg Series live shows. The record is a must-have for anyone who values the work of Dylan or The Band.